The SparkFun Tinker Kit (STK) is a great way to get started with programming and hardware interaction with the Arduino programming language. The STK is our newest version of the former SparkFun Mini Inventor's Kit, blended with elements of our educator MESA kit. Each SparkFun Tinker Kit includes everything you need to complete 11 circuits that will teach you how to blink an LED, read sensors, drive servos, and more. You don't need any previous programming or electronics experience to use this kit. Get Started With the Activity Guide for SparkFun Tinker Kit! Perfect for beginners with all you need to get started and UNDERSTAND. 1- Price point that is accessible to at least 20% of the population of the world, and the world is very poor. 2- The requirements on the development platform (computer) are not too stringent. 3- No manual or power tools are needed. 4- There is quite a support network; but to be honest, the only reason I got it working is because of some video in youtube that SPELLED OUT all the steps. All websites fall short of that. I bought the tinker kit for the extra wires, resistors, the redboard and the motors. I tried to run the servo motor back and forth using the servo position functions in my arduino code within the angular range suggested by the tutorial with a small load attached, but the motor died out. I attached a small load to the white shafts attached on the sides. The problem I'm encountering is that the hobby motor seems to stop working on its own over time. The arduino blue light near pin 13 will keep blinking continuously, but the motor stops rotating. After I let it sit for a minute or two, the motor starts running again. I'd sure like to know whether the hobby gearmotors are low-quality and simply stop working reliably after a few hours or if there is a problem with the circuit. Sorry to hear you're having trouble! Please contact our support department for help with the motor issues you're experiencing and they will be happy to assist you. 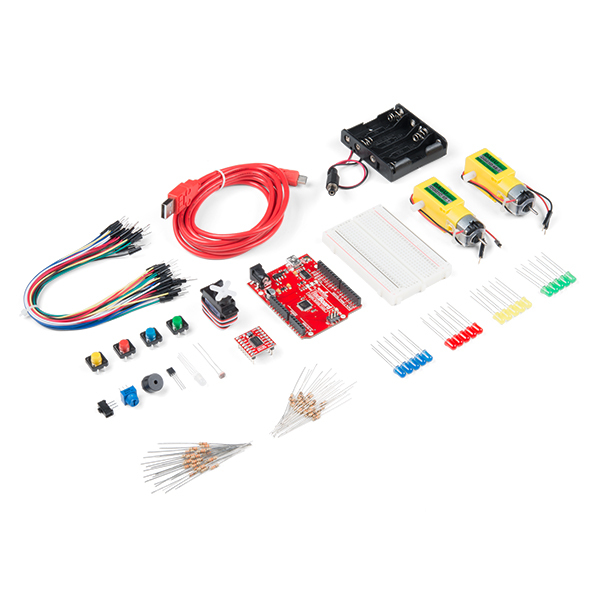 Very good kit for what I need for my mechatronics class. Mine didn't come with any yellow LEDs as shown in picture and kit form, but I'm working in spite of it. (I'd really like the yellow LEDs..) I'm sure it's just a packaging defect? I was surprisingly pleased with the size of the Tinker kit because I had been wondering which would be better, the Tinker kit or the Inventor kit? The Inventors kit doesn't have too much more in the way of the attachments and parts. Arduino website and many other sites have the how-tos given in the Inventor kit's manual. I found that if you've got your own piece of wood or plastic to tape/screw your Uno and Breadboard to and a cheap pencil box for everything, the Tinker kit is the way to go. Hello, and thank you for the review! I'm so sorry the yellow LEDs were missing from your kit. We're going to send those out to you ASAP!